I’ve just taken part in the first phase of a new research study. Mahima was a pleasure to work with and I found it very helpful and insightful to run through the types of conditions I’ve empowered clients to self-heal from. 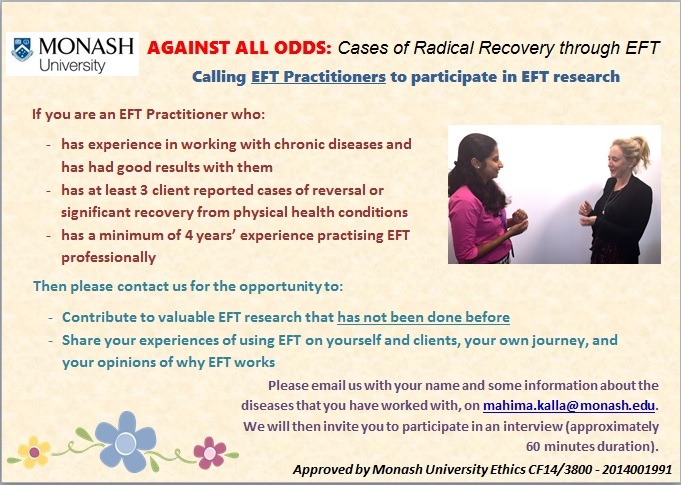 Mahima Kalla is undertaking EFT research at Monash University (Australia) on the topic of radical recovery through EFT. This study will investigate cases of people who should not have recovered according to the Western medicine paradigm, however, experienced a significant recovery against odds. The aim is to understand the experiences of people, who: 1. have recovered from chronic, possibly incurable conditions; and 2. attribute their unexplained recovery (to a large extent) to their use of EFT. There is a huge body of clinical and empirical evidence to support the efficacy of EFT. Would you like to learn and apply EFT tapping?